Stefanie's winner is: Boone Brux! Congrats, Boone! Send me your contact info and I'll pass it along to Stefanie. Thanks to everyone who participated. On a hot summer day nearly eight years ago, I was driving my family from Detroit to St. Louis to visit relatives there. The trip is about nine hours (a little less if you drive like me) and we’d been in the van, clipping along for several hours. My younger son was four at the time; that age where kids are either constantly on your leg begging for attention or lost in their own universe and barely know you exist. At this moment, he was the latter, caught up in some game of imagination far beyond our immediate realm. I listened peripherally to his backseat murmurings. You know, the way you tune in to make sure disaster isn’t imminent because somebody touched the child next to them. His chatter grew louder and louder and something in me riveted on what seemed to be far more than playtime banter. The conversation sounded so lifelike that I sensed an exchange taking place. “Who are you talking to, Sweetie?” I asked as unobtrusively as I could. Okay, folks. I was totally freaked out. Why? Because I come from a very spiritual family: part superstitious, part devoutly religious, some parts both. Among my religious superstitious clan, there are those who profess to have prophetic dreams and see spirits. Comments like, “He’s been here before!” abounded about my oldest son because of a tiny mole near his ear or the way he looked so serious so soon in life. While many people pass those words in jest, I know somewhere deep inside that many of my folks take the sentiment to heart. All of these beliefs left varying impressions on me as a child that I’ve questioned, researched, poo-pooed, or accepted over the years. As a result, I’ve become one of those people who believe that young children can see, hear and observe occurrences in the universe that adults have long since lost touch with. So, I absolutely believed that my son felt he was talking to some formless soul on that long stretch of countryside highway in middle America. What troubled me most was the “Who.” I’d suffered a miscarriage several months before and the still-sad mommy part of me thought perhaps that the lost child had sought out and found his/her sibling. I trekked down the hall to the restroom, tiny cup in hand, increasingly dismayed. But I obliged. And you know what happened next, right? And after the physical exam, my doctor felt like I was VERY pregnant. This would be my fourth pregnancy so you’d think I’d know what was going on. Yet there were no symptoms whatsoever – not even a missed monthly. No nausea, no fatigue, no tenderness. Nada. The next week we found out I was ten weeks pregnant. OMG. I was stunned. And five weeks later through a follow up ultrasound, I discovered I was having a girl. My son was right. He was talking to his sister. For me, the backseat incident confirmed and continues to reaffirm a personal need to tune into the outer world. Maybe my son’s remarks made me eat better or rest more or subconsciously perform some act that helped ensure his sister’s prenatal health. I have no idea really. But, I can’t help but bring such experiences into my writing; weaving such extraordinary occurrences into every day circumstances. What about you? Have you ever had a hunch, a dream, a well-placed word from a friend or stranger that changed your outlook or direction? Do you write this off as coincidence or consider it destiny? I’d love to hear your thoughts. 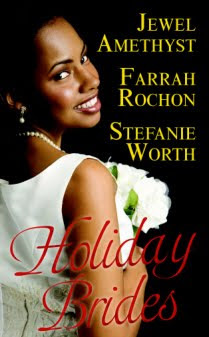 And one lucky person who comments today will receive an autographed copy of Holiday Brides. 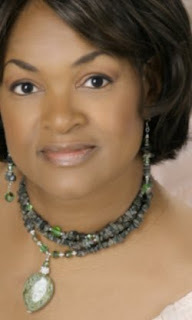 Thanks for joining me at this stop on my HeavenSent Holiday Brides blog tour. You can learn more about me and my work at www.stefanieworth.com. I’d also like to extend an extra special thanks to Lynda for hosting me today and allowing me to share such a fond memory. Stephanie's winner will be selected and posted on Tuesday evening. Check back to see if you've won. Thank you for having Stefanie Worth here today & thanks to Stefanie for sharing. Your story gave me goosebumps. When my sister & were travelling in the US, in Grand Rapids, Michigan, we were hit by a vehicle from behind. The car was totaled, the seats were twisted, the seatbelts snapped off, and after a few 360s we ended up in the ditch. We both only suffered a sore neck. Strangest thing, we both said simultaneously, "Thank you Grampa". I don't really know why, unless a part of us knew he had saved us. I had so many weird spiritual paranormal stuff but one that really changed my direction was: I had a dream where I was shown my older son (now 23, then age 3) being beaten by two older boys (about 11 and 13) from up the block. They were beating him senselessly with a metal rob. I woke up and went through the day. Imagine my surprise when around midday these two boys dropped by to see me and my son. They had never done so before but they were the older son and nephew of a neighbor whose little son played with my son. "Carole," said they, "we want to play cowboys and indians and we want a hostage to tie up and pretend to beat up." They showed me a little ribbon and let it gently rub against my skin. "See, it doesn't hurt." Needless to say, although my son kept saying he wanted to go play with them, I said "NO!" To this day I wonder what would've happened if I'd given in to a lonely little kid's desire to have friends and had allowed it. Who knows but that the boys were planning evil? or that even if they weren't planning evil...evil would come out of it sooner or later? Stefanie, I've never had anything like that happen to me (or at least I have yet to open my mind and accept it), but it happens all the time on my mom's side of the family. I believe children do have some connection that we don't. When I was 18, I babysat frequently for a family with a two-year-old daughter. One night, after putting her to bed, I kept hearing her talking in her crib. I went into the room and asked who she was talking to. She pointed at the empty rocking chair in the corner, and said, "Poppy." She finally fell asleep, and later when her mother came home, I mentioned the incident to her. Her mother looked as if she was going to pass out, and said, "Are you sure she said 'Poppy?'" I nodded. She said, "That's what we called my father. He died five years ago, three years before Lyndsey was born." RK, Carole and Susan -- I love your stories! I'm glad you came out of that awful accident alright, RK. And Carole, yay to you for following your guidance and not letting your son go out and play. I'm sure his disappointment was easy to live with compared with what you envisioned. And Susan, how sweet that the baby had her grandfather watching over her! As hard as we try, I think there is so much we don't control in the universe. Then again, in our examples, is that a bad thing? Farrah -- My awareness stems from my mother's side as well. I wouldn't really know if these things happen on my dad's side because he's a very analytical, methodical man. I can't imagine him even entertaining such happenings. I inherited his sense of logic, but I'm also convinced that science doesn't have an answer for everything. What a fabulous story about your son. Thanks so much for sharing! Enjoyed the post today, looking forward to this one! Cindy and Tetewa -- Thank you for your comments and for stopping by! My husband and I are very matter-of-fact about spirits and the unseen universe. There's no doubt in our mind that it exists. We went through invitro and I was pregnant with triplets. Early on one of the babies reabsorbed and I ended up having twin girls. From the time they could talk, they would say things about their brother. Then they would add that he didn't get born. I have no doubt in my mind that they were talking about baby C during my pregnancy. I agree that kids have 6th sense that we as adults seem to lose along the way. Loved the blog. My what an awesome story about your son. It cause chills to read it but it sure was something else. I am glad you shared it with all of us. Thank you so much. I hope my comment will be entered in the drawing too. susan L.
Wow, this story just gave me chills. I really enjoyed it. Wow, thank you so much for sharing. Your story was intense. Vicki -- I'm convinced that the same suspension of disbelief that allows kids to believe in Santa and the Tooth Fairy works with the supernatural world as well. Perhaps hitting the "age of wisdom," which is what -- 8? --takes more from us than we realize. Boone -- I figure that if twins separated at birth can go through life feelings something/someone is missing, then certainly your girls would feel that, too. How amazing to witness that connection! Susan, Stephani and Mary -- I didn't mean to give you the willies! But I'm glad you enjoyed my post. Thanks to everybody for dropping by! I'm late to the discussion, but so glad I came! I have no doubt that children are tuned in to other planes. If I'd been a skeptic before, my son turned me into a believer.